I’ve officially dubbed this coat “The Elmo Coat.” It’s ridiculous, it’s bright, it’s actually SUPER warm. You’ve already seen it on Instagram a few times if you follow me there. I wore this out one night and the restaurant hostess said I looked like Cruella de Ville, if she lived on Sesame Street. AND I. AM. HERE FOR IT. The thing about wearing a super fluffy coat is that people want to pet you. As long as you’re prepared for that, it’s otherwise a fun and rewarding experience. You also have to be prepared for constant whispers behind your back. Some will love it, some will hate it. Some will try to pose with you, thinking you’re the Times Square Elmo. Own it, girlfriend. But most importantly, never forget where you came from. Coat, Asos (exact - on super sale so heart and watch for returns). Sweater, Atlantic Pacific x Halogen (exact sold out // similar from NY & Co). Boots, Stuart Weitzman (this dupe on Amazon has great reviews!). Bag, Balenciaga (City bags on Poshmark). Looking through these photos, February was a pretty casual month for me. Wardrobe MVPs were definitely sneakers and sweaters that cover my hands - and leggings. Lots and lots of leggings. It’s like my bottom half was heading to the gym, while my top half was hanging out at coffee shops. 2/1: I pulled on this Asos sweater a few times this month. It’s super soft and the bright color made me happy. I also discovered Old Navy’s Stevie “pants” aka thick leggings this month - I love them. 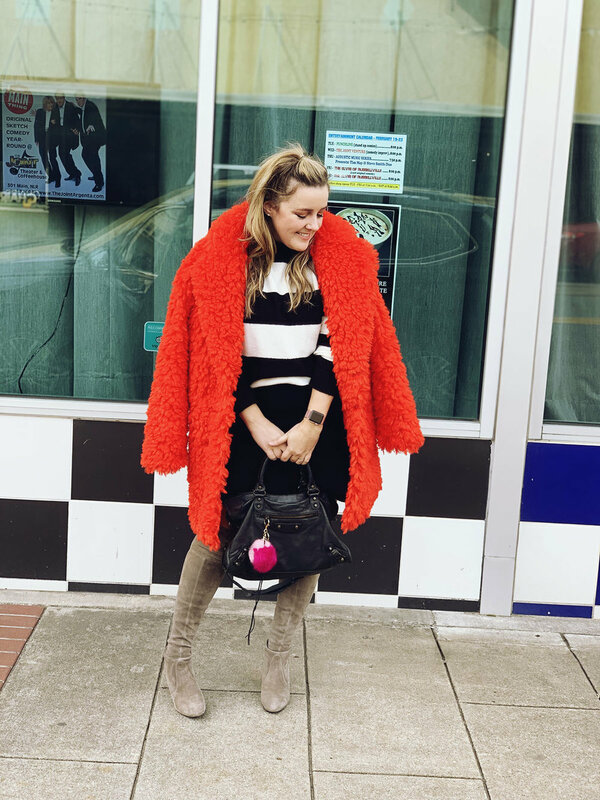 2/2: I stalked this sweater from the Atlantic Pacific x Halogen collection for about a month before finally ordering it - JUST in time, too, because it went on sale and sold out a day later (you know I got that price adjustment!). I’ve worn it every day I didn’t wear the blue sweater. You’ll also see these brogues / oxfords a few times this month; they were an Amazon purchase and SO comfy. 2/3: I guess it was warm enough for no sleeves today! No idea what we did this day, but these Old Navy leggings (the high rise 7/8!) are my favorite, and this Theory sweater has been going strong for at least five years now. 2/4: A nice mild day in Little Rock, and you probably saw this dress on Instagram. I love a long sleeve dress and this print is too cute. 2/5: Tuesday is my work from home day, which means you’ll typically find me at Nexus tapping away on my laptop and drinking a bottomless drip (I take it black, thanks). I’ve been wearing the heck out of this Craft jacket I ordered from Peloton. It’s warm, it has a cute shape, and I get to rep my favorite bike. Please buy a Peloton using my code HM8UTY so I can get more merch and you can get $100 to the boutique. 2/6: I ordered the Everlane Day Glove when they had a sale on them, and the jury is still out on these. They definitely have a “breaking in” period that I’m still going through. I like the idea, though. 2/7: I was really into the idea of a casual suit vibe, so I tried on about three different tees with this suit before I settled on this one from Everlane. These are those comfy Amazon shoes again! Seriously, I love them. 2/8 (day): Spent my day at a radiothon for Make-A-Wish, so I wanted to be comfy (and warm!). I got this sweater at H&M when I thought I didn’t have a pink sweater. Turns out, this was my third one, but it’s long and soft and perfect for leggings. In looking for it to link, I discovered they make a bunch of other colors. NEED. 2/8 (night): Dinner with friends at Bruno’s. 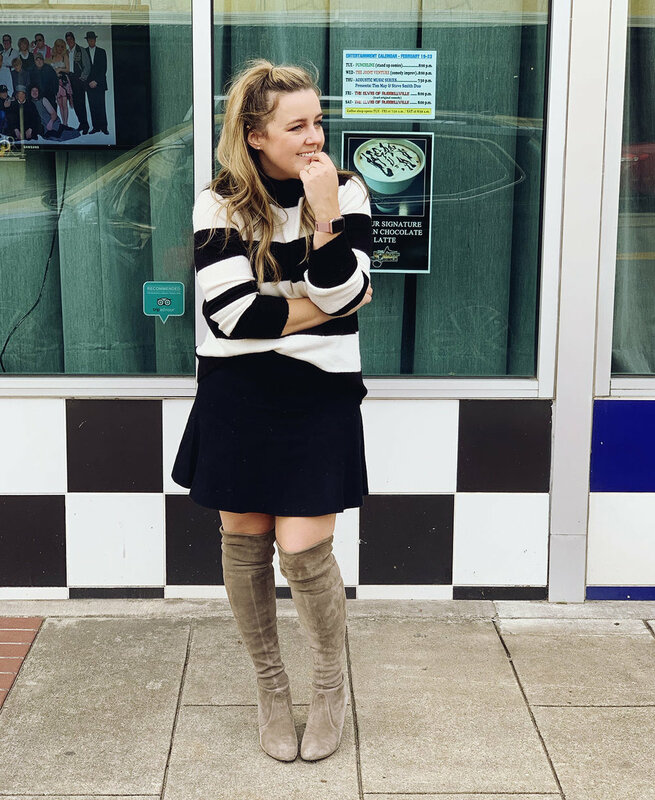 My friend Erin always dresses to impress so leggings + sweater weren’t gonna cut it. 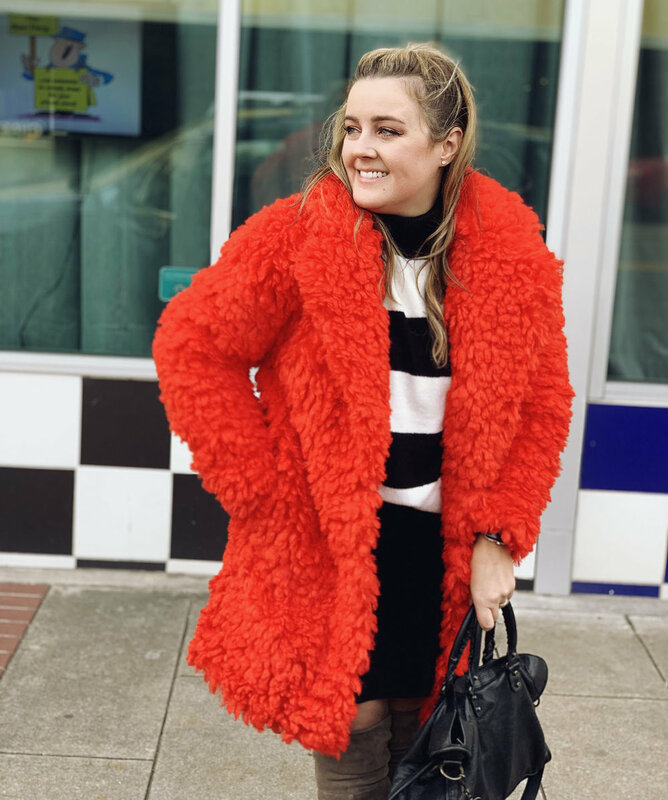 I also took this opportunity to debut my new Elmo coat (it’s a hit - exact on sale!). 2/11: This is a Before/After. I’m all dressed and feeling cute for work on Monday, only to walk outside and realize it’s really too cold and rainy for loafers. I added my beloved Zara raincoat (this season’s version) and some JustFab rainboots and then I was good to go. 2/13: Valentine’s Week! Love this dress SheIn sent me for the holiday - it’s perfect for work. 2/14: Decided to be festive for V-Day in all red, froze to death and put on pants when I went home for lunch. 2/15: This sweater from H&M is another MVP for this month - it’s so easy to throw on and go. Pretty sure this is the one. 2/18: I guess I didn’t get dressed all weekend. I did, however, have to go to work on President’s Day so I decided it might as well be in these awesome boots. Hey look, it’s that AP sweater again! Seriously, this thing rocks. 2/19: I fully admit to only getting dressed to go to a committee meeting today. It was cold so I was back in leggings for the afternoon. Dress c/o SheIn was a big hit at the meeting, though! 2/20 (day): Casual look for work. What’s that? The pink sweater? At some point, I’m gonna have to admit my wardrobe this month was less about “favorites” and more about “what’s in a pile on the floor”. 2/20 (night): Our friends got a table for a drag show benefit at South on Main so I decided to dress up a bit and throw on these snazzy pants from Asos. Guess what??????? THERE’S A MATCHING TOP. Also a little kid spilled his entire coke on me so I’m never leaving the house again. 2/21: I stole this cardigan from my husband, thinking I would get that cool, oversized Grandpa look. I forgot that he and I are basically the same size so it just looks like my cardigan. But look, cute socks with those Amazon shoes. 2/25: I have fully committed to the suit for spring. This is one that I bought a few years ago and never bothered to wear together (blogged here). I felt like I was wearing fancy pajamas, but got so many compliments! 2/26: Work from home day - aka, coffee shop. We also went and saw Crazy Rich Asians at the Ron Robinson Theater which was so cute. Comfy pink sweater sighting!! 2/27: Another suit - c/o SheIn and maybe too early to wear it, but with tights it worked out. Amazon shoes again. I’m not gonna lie, it was a little cold for this today but that’s what the indoors is for. 2/28: Work then Chicago with my girlfriends at The Rep! 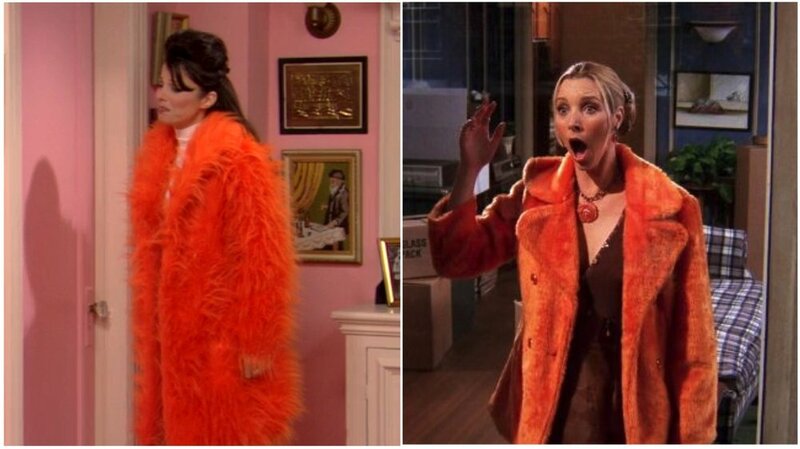 I ended up swapping my t-shirt and jacket for a comfy sweater (that white one from H&M) and my Elmo coat since it was so cold, but the general idea remained the same. Also - Chicago is on until March 24th - go see it. It’s absolutely awesome and we want The Rep to survive. It does not matter how much I plan, I cannot get my blog photos together for some reason. A few weeks ago, I planned a big blog photo day, only to realize I didn’t have the plate to connect my camera to my tripod. Another time, I couldn’t find the remote. And yesterday, I pulled out a fully exhausted battery, despite having taken no photos (my backup batteries must have been in another purse, of course). The good news is, the iPhone XS takes some pretty dang good photos, I always have a little phone tripod in my car, and the Apple Watch lets you preview and take photos on your wrist! My entire life is a backup plan. So if you’re ever sitting there thinking, “Hmm, the quality of this blog seems to be suffering,” it’s definitely that, and not my eternal laziness. 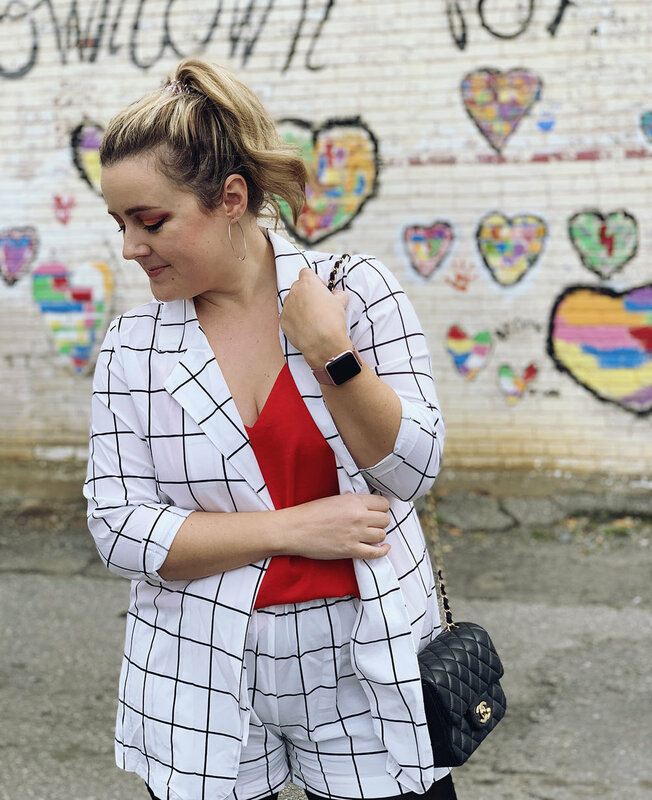 Suit, c/o SheIn (exact - 15% off with code Q1ajwears15!). Top, Express (exact, on sale!). Shoes, Amazon (exact - these are SO comfy! ).